This article is about the spiked fish from Super Mario World. For the boss in Mario Pinball Land, see Porcupuffer (boss). Porcupuffers (alternatively Porcu-Puffers) are a species of large, garishly-colored Cheep Cheeps that first debuted in Super Mario World. They resemble gigantic indigo Cheep Cheeps with magenta lips and blue, cyan, and yellow spikes all over their back. Their faces are nearly identical to those of Boss Basses and Cheep Chomps, but unlike them, they never try to eat Mario. Their name is a portmanteau of "porcupine" and "pufferfish". Porcu-Puffers appear in Super Mario World, where they follow Mario and Luigi in the water. The Mario Bros. can perform the Spin Jump on them to "ride" them, or use Yoshi. They appear in three levels: the third secret level on top of the Vanilla Dome, a secret area in the Cookie Mountain level, and a hidden area within Chocolate Island 1. Unlike the Floating Mines, they are vulnerable to fireballs. 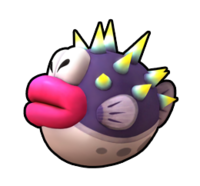 The in-game sprite depicts them with magenta lips while the artwork depicts them with yellow lips. After a long absence, Porcupuffers are featured again in New Super Mario Bros. Wii. Here, they attack exactly the same as the Spike Bass in the predecessor, swimming near the surface to pursue the plumber and his party or even leaping from the water to attack. Porcupuffers serve as obstacles for World 4, and they appear again in World 6-5 and later in World 9-2. They can only be defeated with a fireball, star or Koopa Shell; another one will come to take its place several seconds later. This also occurs in the Enemy Courses, although the replacement occurs much quicker. They can also be frozen, but they crack out almost instantly, much like a Spiny Cheep Cheep. Porcupuffers later appear in Super Mario 3D Land, inhabiting underwater and beach levels. They retain their appearance from New Super Mario Bros. Wii. In this game, Porcupuffers swim back and forth while underwater, while in World 6-1, they jump out of the water in specific locations attempting to hurt Mario, and may even break some portions of the bridge he uses to reach the end of the level. Aside from the bridge-breaking, these behaviors are shared by this game's Cheep Cheeps, making them functionally similar to a Big Cheep Cheep in this game, albeit with spikes. Porcupuffers reappear in New Super Mario Bros. 2 , acting the same as they did in New Super Mario Bros. Wii. Here, they appear in World Flower -2 and World Star -4. They also appear in stage one of the Impossible Pack downloadable content. This game shows that Porcupuffers can survive swimming in poison. Porcupuffers once again appear in New Super Mario Bros. U, behaving the same way as in its predecessors. They only appear in Porcupuffer Falls in Rock-Candy Mines. In New Super Luigi U, they appear in Porcupuffer Cavern in Rock-Candy Mines. Porcupuffers return in Super Mario 3D World. They behave the same way they do in Super Mario 3D Land. They only appear in Pipeline Lagoon. Porcupuffers appear as enemies that can be placed in Super Mario Maker 2 stages. In Mario Kart Arcade GP, an item known as a Needle Bomb appears, which resembles a Porcupuffer. In Mario Kart Arcade GP DX, they appear as an item that can be placed on the course. They can come singularly, or in a group of three as an item dubbed "Triple Porcupuffer". 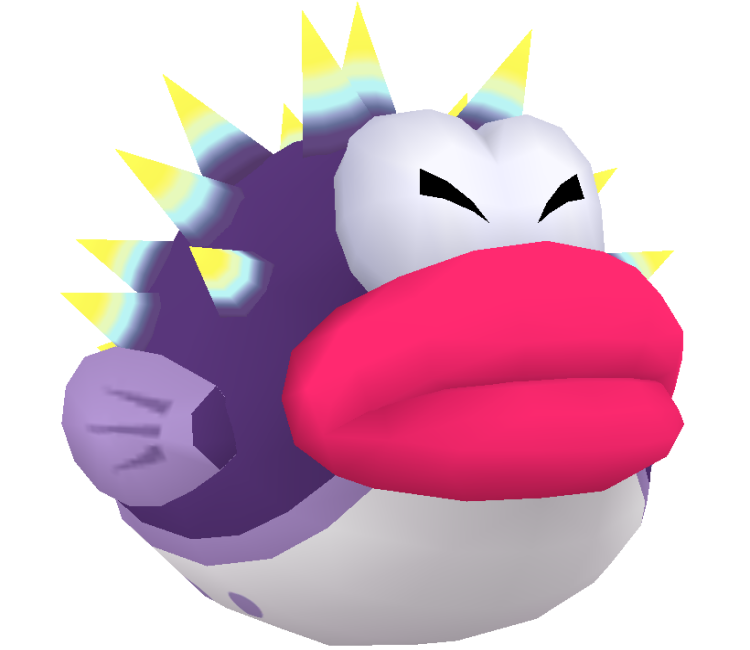 Porcupuffers also appear in Mario & Sonic at the London 2012 Olympic Games. During the Dream Rafting event, the second task a team is required to do is defeat some Porcupuffers. To defeat these Porcupuffers, the participants must Ground Pound the raft at the same time when they're beneath it. They also appear during the Highway Tally game in London Party mode. In Mario + Rabbids Kingdom Battle, four Porcupuffers make cameo appearances as fountain statues in Gallery mode. Porcupuffers appear in Super Mario Party as non-playable characters. A Porcupuffer can appear along with a Blooper and a Cheep Cheep in the minigame Rattle and Hmmm. Fugumannen From Fugu, the Japanese name for pufferfish, and 「万年」 mannen, meaning "ten thousand years". May possibly be a reference to Harimannen. French (NOE) Porc Kipic Distortion of the word Porc-épic meaning "Porcupine"
Bulttukbogeo From 불뚝(Bulttuk), a mimetic word for something soaring up and 복어(Bogeo), meaning Pufferfish. Cheep Chomp is incorrectly referred to as a Porcupuffer in the New Super Mario Bros. Wii Prima guide, despite being named correctly when describing Cheep Cheeps. The lone Spiny Cheep Cheep of Super Mario Galaxy 2 is mislabeled as a Porcupuffer by the game's Prima guide. In Minecraft, the Super Mario Mash-Up Pack replaces the skins of the Elder Guardians to skins of Porcupuffers, as well as replacing Pufferfish. ↑ Nintendo Mario Mania Player's Guide. Page 51. ↑ von Esmarch, Nick. 2012. New Super Mario Bros. 2 Prima Official Game Guide. Page 25. ↑ Bueno, Fernando. New Super Mario Bros. Wii PRIMA Official Game Guide. Pages 122, 123 and 176. ↑ Bueno, Fernando. New Super Mario Bros. Wii PRIMA Official Game Guide, pages 82 and 176. ↑ Bueno, Fernando. New Super Mario Bros. Wii PRIMA Official Game Guide, page 14. ↑ Browne, Catherine. Super Mario Galaxy 2 PRIMA Official Game Guide, pages 28 and 90. This page was last edited on April 5, 2019, at 21:29.